There is no lift bigger than the mighty deadlift. The ultimate test of whole body strength, and almost certainly the largest weight you lift in the gym, hits more muscle fibers than any other exercise. 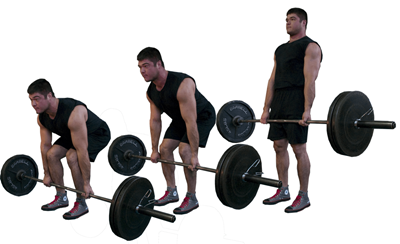 Put simply, the deadlift HAS to play a large part in your training regime. 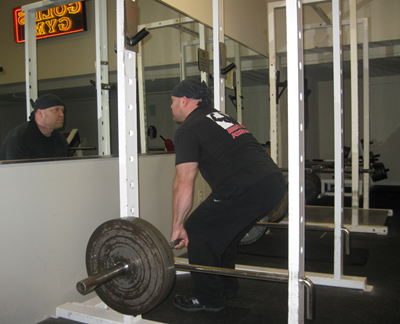 The only people who get a pass are those with lower back problems, and even then the deadlift should be playing an important part in most of their rehabilitation programs. [caption id="attachment_4887" align="alignleft" width="400"] Pic: generationiron.com[/caption] As mighty as the deadlift is, it is also just about the simplest of movements to execute (when done correctly). The dynamics of the movement and low center of gravity combine for stability. You just need to use proper technique to avoid serious injury and effectively hit the target muscles. 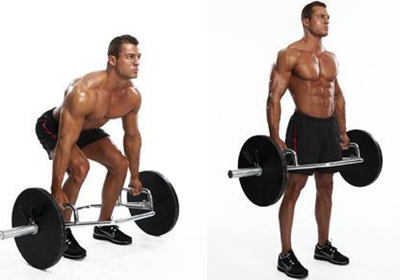 These target muscles are predominantly those of the lower back, but the deadlift stimulates and adds thickness to everything from your calves to your neck. It really is the ultimate lift. Another reason for regular, heavy deadlifting is the huge anabolic effect it has on the body. Hoisting that bar up from the ground places so much stress and strain on the musculature and skeleton that it kicks off a chain of events in the bloodstream, culminating in a surge in muscle building hormones, especially testosterone, and human growth hormone. This leads to an increase in growth and repair lasting for days after each session. Squats are another exercise affecting the body similarly, so spreading these lifts out over the week leads to a consistent rise in anabolic activity. An excellent way to amplify this potent anabolic blood chemistry is taking a top quality testosterone boosting supplement. Sheer Strength Labs Sheer Alpha Anabolic Testosterone Booster sends your levels sky high. Packed with powerful and proven ingredients, Sheer Alpha works with your body to stimulate massively elevated production of natural testosterone. There are many benefits of increasing your natural testosterone. As well as promoting muscle growth and fat loss, elevated testosterone improves focus, drive, energy levels, and mood, as well as enhancing sleep. [caption id="attachment_4888" align="alignright" width="400"] Pic: powerx[/caption] Begin with the bar on the floor in front of you. Standing with your feet approximately hip-width apart, and your toes pointing outwards slightly. This stance suits most people. However, this is not absolutely set in stone. Use the stance that feels right for you, but don’t let your feet drift too wide. Take hold of the bar with your hands just outside of your legs. Keep your arms straight, think of them as hooks. You can use a double overhand, or an alternate grip (pictured). Now bend your knees, drop your hips back, flatten your back, and lift your chest. Don’t arch your back, just flatten it. Look up slightly, but don’t pull your head right back. Pull the bar back into your shins. You should be in the start position pictured above, with your back flat and your shoulders over the bar. Now pull that bar upwards by straightening your hips and knees. The bar should rise in a straight line, right up your shins. Straighten up at the top, pull your shoulders back, and thrust your hips through, but don’t hyperextend your lower back too far, or lean backward. Now lower the bar in a straight line back to the start position. Lower Back. As previously mentioned, do not arch your lower back, just flatten it. Arching is actually a weak position leading to nasty injuries. A flat and neutral back is the strongest position. Use a weightlifting belt if possible. You need to experiment with a few different styles, as some people find some types of belts restrictive on the stomach area during deadlifting, and can cause discomfort. Feet and Legs. Choose a stance that suits your anatomy. Hip-width with toes slightly outwards works for most people, but the important thing is your knees stay over your feet and do not bow inwards. Use knee wraps if you have any worries over knee safety. Many people find an alternate grip helps keep the bar close to the body, and aids in overall grip strength, due to the opposing forces. It is important to keep your shoulders level, and your back flat. Grip the bar as narrow as possible, just outside your knees, to avoid shoulder problems. When actually gripping the bar, avoid taking the bar too high in your hands. Grip the bar lower down, near your fingers, to avoid skin tearing and excessive callus development. The Lift. Always take the slight slack out of the bar before beginning your pull. This avoids any jerking. Keep the bar close, pull through a straight, vertical line, driving the floor away with your heels.